Renowned Georgian singers Ensemble Adilei and the Chamgeliani Sisters share an evening of Georgian polyphonic singing and accompaniment on ch'uniri (3-string viol). The young men of Ensemble Adilei not only impress with their vocal prowess and technical skills (especially when it comes to k'rimanchuli, a yodeling technique from the Western part of the country), but their energy, dedication to the folk music tradition, and lovely rapport they establish with their audiences. In the past two years, Ensemble Adilei has toured in Italy, Germany, and the Eastern U.S. They have conducted class visits/demonstrations, workshops, lectures, and seminars, including appearances at college campuses around the U.S.
Sisters Ana and Madona Chamgeliani come from a long lineage of singers from the mountainous province of Svaneti, where they grew up. These women are not only great singers, but also possess deep knowledge of the contexts and traditions that surround the songs they perform. Ana, who is also a member of ensemble Sathanao, is a virtuoso on the ch'uniri, a 3-string bowed viol, traditionally played in Svaneti and a few other surrounding provinces. Madona is an ethnomusicologist and scholar of Svan folklore. The sisters and have toured extensively throughout Europe and frequently collaborate and exchange musical repertoire with Adilei, both at home and abroad. 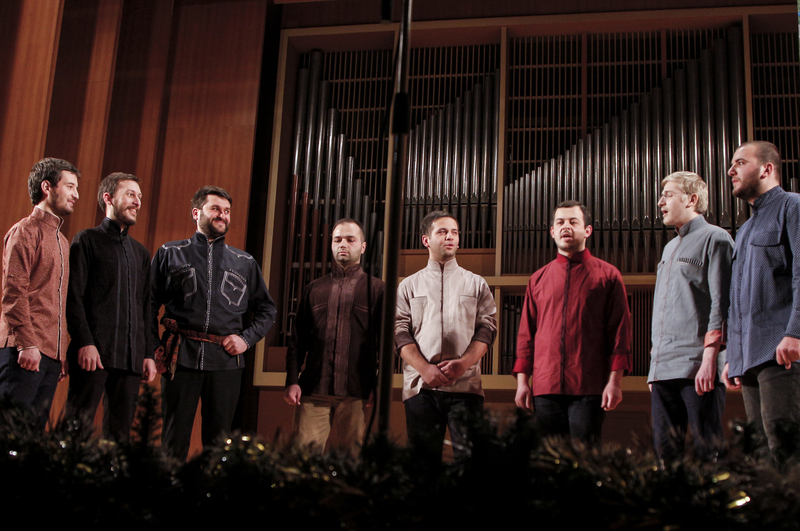 About Georgian Polyphony: Most frequently, Georgian songs consist of three voice parts all of which can have many patterns of movement, depending on the region. (Every province has its own signature style). In addition to the intricate multi-part structure, traditional Georgian music uses a kind of “untempered” tuning that differs from the Western Classical system.